Paul, is it to early to set up the 2015 meatpole? 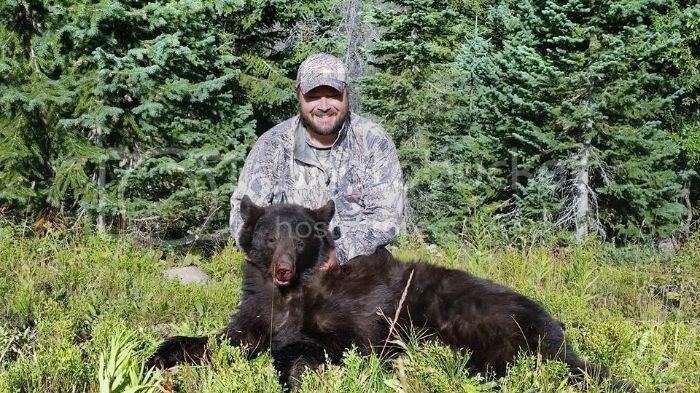 There has been some really nice spring bears posted on the site earlier,and just looking for some 2015 kill pics!!! Heck no, let's do it! 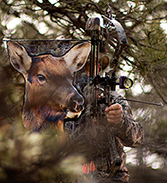 Show any big game animal here, doesn't matter if it's with a Bow, MZ, Rifle or slingshot! (grin) Good luck to all! Let the season begin!! 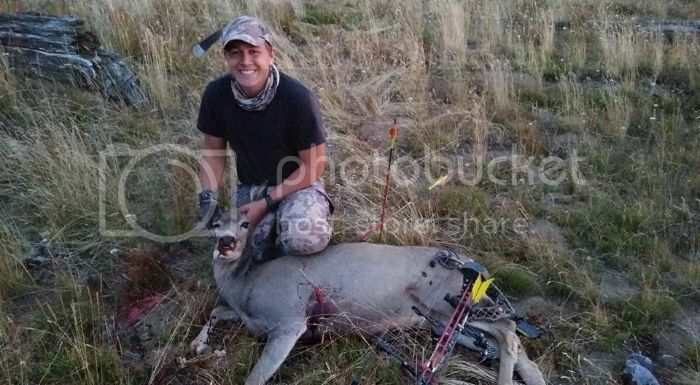 Here's the 1st this year for the ElkNut Crew, it's Clayton's Antelope, (joeh2o) It's a stud for sure, I believe it was a 40 yard shot accompanied by a great open country stalk! Congrats dude! Here we go!!! I leave in 2 weeks. 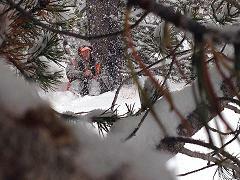 It has been a long year since we starting making our archery elk plans! Good luck all you elknuts (lower case) out there. Beautiful Lope there!!!!! 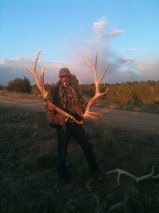 I hope to get a chance at one here in NM next year. Got this one last weekend in Colorado. Not the biggest we saw, but the meat actually tastes great. I did a fast count, there was around 17 more picture's in 2014 compared to 2013 lets see if we can do better than both of those years. Great start with the speed goats, nice job. I'll see what I can do to help that, Friday ! Those are some cool lookin lopes! congrats guys! “Tell me and I forget, teach me and I may remember, involve me and I learn.” ~ Benjamin Franklin. Here is my goat I shot yesterday (August 23rd). I was able to maneuver through open country to shoot him in his bed at 30 yards. 2015 is off to a solid start! awesome guys! it has begun! Sweet! Way to start this year off with a bang guys! Congrats on the lopes guys! Awesome start and awesome buck! Nice Lopes and a beauty buck! Im counting down until we leave michigan for colorado.....9 days 3 hrs...28 minutes!! Chasin Chuckles by next thursday! God luck gents! Shoot strait! Will, way to go, nice velvet buck sir! Congratulations otcWill. Looks like you did your homework way before Saturday. I've been lucky this year. I was able to tag out. And I was helping out a buddy with his LE tag and decided to use my archer's choice this cow. elkmule123 wrote: I've been lucky this year. I was able to tag out. Nicely done! 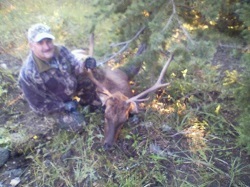 First elk on the Elknut newsfeed! Wow! Nice,but he still has velvet. Are you sure it's not spring there! LOL. 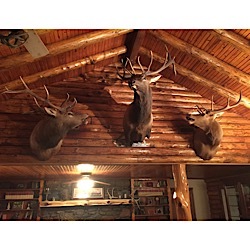 I have a whitetail buck hangs here with 3 smaller ones but he has a beautiful rack. Hope to save him for seed. That's one of the nice benefits of the Utah archery hunt. It starts generally around the 20th, but this year it started on the 15th. There was one lucky guy that harvested a nice 6 point elk still in velvet. Awesome guys. Hope everyone has the best of luck! 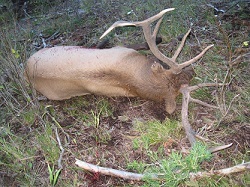 7 days till I will be in the elk woods, whopeeeeeeeeeeeeeeeeeeeee!!!!!!! Shot this five point on Friday. first bull on the pole, nice work!!! I got beat by a day !? Nice job Poneyboy. Stay Golden. Took this guy Saturday morning in the middle of a thunder blizzard. Caught him sparring with another bull. 34 yard frontal shot. 10 yard recovery. 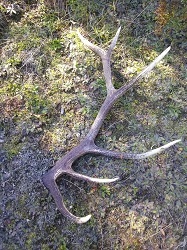 One down for the freezer - next one's for the wall ! The rut's just barely starting here. 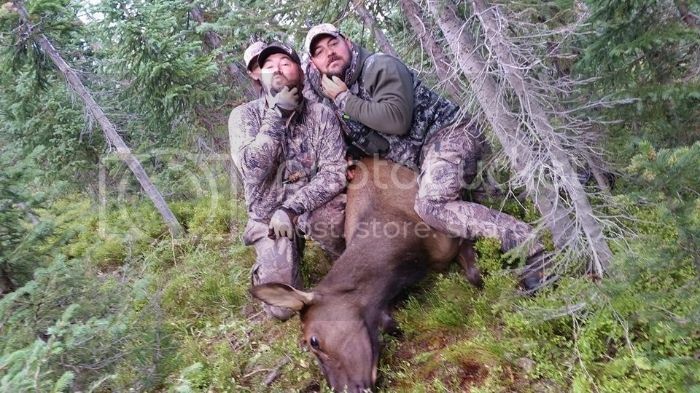 Thank you powderhogg and nice elk huntrgathr!!! I shot it on the opener only about a mile from the truck. We made friends with a group of bow hunters that stayed at the same campground as us. And once I had the elk on the ground they offered to come out and help us haul the meat out. That was a huge help because while my dad and I were quartering the elk, his dull knife slipped and he gave himself a pretty good cut in his thigh. Good thing we brought extra game bags, because that's what we wrapped up the cut with. lol. That made him not able to carry much weight, but it only resulted in 6 stitches and he is doing fine now. sounds like an awesome experience for the memory bank no doubt. I carry a hunter specialties skinning and gutting knife as well as a small ceramic stone and their sharpener. 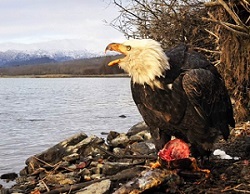 been there with the dull knife.. not again..
haha we in fact just threw that knife away. He used a big buck knife that was sharp right away then quickly got dull. Way to go guys, things are looking up, bulls are starting to fall, great job! 34 yard frontal shot, wow! You must have ice water in your veins! (grin) Heck of a shot bud! Thats cool how Huntrgathr's bulls eye guard goes down! Congrats guys! Congratulations to everyone successful so far. 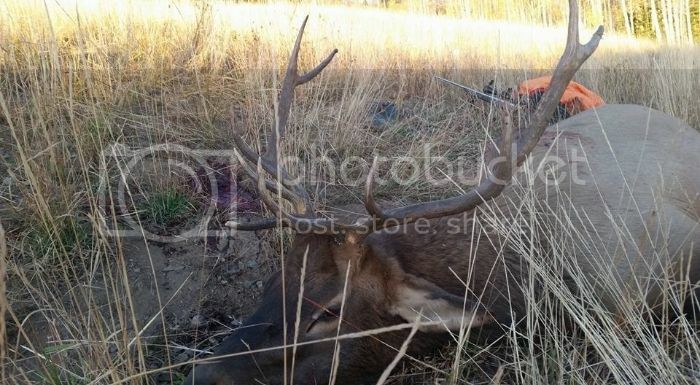 So I called this in for my buddy and let him shoot it since he never shot an elk with his bow. I regret the decision now. Knew he was big when I saw him from a distance, but not his big. This is a pic of me with the bull. 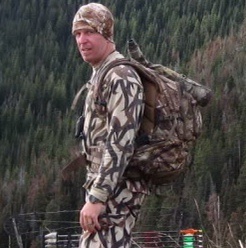 Dang how close was he , I see the KUIU vias camp. Was that in Colorado?????? Called him to 35 yards. I told my buddy he will stop there..amd he did. Crazy. This is Wyoming. I like the Vias camo, really breaks things up. I know, it will haunt me now. Crazy thing is that I saw another as big as him that evening on my hunt. He is a little more call shy. Will give it another go here in 2 weeks. 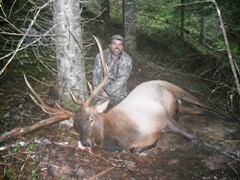 whitingja wrote: So I called this in for my buddy and let him shoot it since he never shot an elk with his bow. I regret the decision now. Knew he was big when I saw him from a distance, but not his big. Horse of a bull Jason! Congrats to you and your buddy. Thanks Phantom. Probably will never see one that big again up close like that. Jason, very sweet bull sir! Congrats to the both of you! Thanks Paul. Your DVD's came in handy. Awesome everyone! Keep em coming! 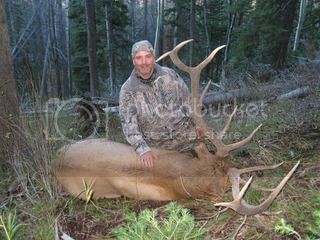 whitingja wrote: So I called this in for my buddy and let him shoot it since he never shot an elk with his bow. I regret the decision now. Knew he was big when I saw him from a distance, but not his big. This is a pic of me with the bull. Things like this have a high value in my viewpoint, and you will be remembered by your buddy forever for being so generous. I'm equally happy that he made a good shot! My buddy arrowed his first elk Saturday evening (a cow) - I tried to put up a picture but can't figure out how to do it. Great trip but too short! Aside from killing that cow, we found what we think is a good spot for the future. Got into lots of elk and made our moves to get into two other close encounters (first one, my buddy shot over a spike's back, and the other I had a raghorn at 15 yds. but couldn't get a shot opportunity). We hunted hard in some tough country and we're super stoked with the experience and to be able to take meat home. Big thanks to many of the members on this sight for their advice and tips. Big thanks to Paul for providing this forum. I learned a lot from the playbook and also the videos. Also, Big thanks to Indian Summer for his help on PMs for scouting advice on topos and such. I wouldn't have thought to look at this area without his expertise - thank you so much. My hunting partner and I really stepped up our game this year and a huge part of that was this forum and the wealth of knowledge. Couldn't thank you all enough! Already pumped for next year! I was in pretty good shape for this hunt but I want to be in better shape next year. I also want to shoot more (and hopefully get some newer equipment). Only 364 more days to go! Good luck to everyone that is out there now or heading out in the near future! Paul II scores again! (grin) Story on Elk Forum! Arrowed this 4X4 on 9/9 at 28 yards. He came in totally silent to a few bugles. To the best of our knowledge the bulls were already with cows and very reluctant to respond to any calls. All in all not too shabby for a bunch of "tenderfoots"! ElkNut1 wrote: Paul II scores again! (grin) Story on Elk Forum! Glad to see your dad also made it in the photo he posted on the thread: "Any Success Yet?" I have yet to hear one bugle this season where I have been hunting. Fresh sign, and bumped a couple cows, but no bulls. Heard a couple howls from wolves the other evening though, so this may be why the bulls are keeping quiet. Shot this fella at 30 yards. Found him in his bed, he jumped when I got to the 30 mark. I froze, for 10 minutes we were stalemate before he calmed down. He stepped out from a tree and stepped right over his bed. I went full draw and he jumped again but only went a few feet.. we sat locked for what felt like forever before he finally offered a shot. Nice bulls Paul II and Chuckles. Haven't heard any bugles either. Got several nervous grunts from one bull but he stayed stuck in cover. Nice bull paul ll. I'm sure there's a good story to go with that bull. But to you folks that have been successful this year, my hat is off to you. Great job, to get it done with these conditions is outstanding.!. I wanted to give you a big thanks! This is my second elk in as many years. This year I called in 4 bulls before this one. The closest was 6 yards, which I managed to screw up. You are an inspiration and a true professional. Congrats to Paul the Second on his bull. Hope you are out pulling back on yours now. 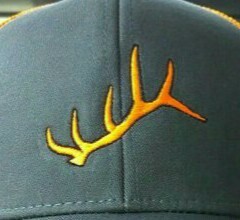 I recently purchased one of your elk decoys for my AZ elk hunt. It was one of the essential items I carried each day in the field. As you can see from the picture, I was very blessed with a bull of a lifetime. Thank you for such a great product... lightweight, durable, and extremely effective! Can't wait to try your other decoys on future hunts. That's a beauty. Great job! First Archery Bull for me - I'm pretty excited. Thanks to Paul and everyone else for the tips and strategies. By myself at the time, he responded to a locate bugle, and kept bugling and coming in. That's a great first bull nwilt! Congratulations! Shot my first this year too! Gets the heart going just thinking about it! Thanks to what I learned on this site and the Playbook, I had 2 really cool encouters. The second time I connected on a nice 6X6! He bugled, my buddy responded with pleading cow calls, he chuckled and we let him call us right in until we couldn't close the last few yards we needed! My buddy did a great job convincing him to move the last few yards for my shot. Shot him at 40 yards! I cannot post the picture however. Fantastic!! You guys are all doing awesome! Back from Colorado. My cow muzzleloader tag went unfilled. However, we accomplished out main goal of getting my brother his first archey bull. Called this guy in on the last hour of our last day in the deepest, steepest, nastiest valley in our area. Did the Caller/Shooter tag team. We had been in this valley all day, and this guy finally answered after perhaps my 20th Bugle. Once he answered, he responded to every noise I made, and was shot broadside at 18 yards in less than 3 minutes. Shot placement was not ideal - pass through liver - but he was dead in 60 min and only went 75 yards. Epic hardship on the carry out. This week I made a couple of observations - Bugles are more effective than cow calls, and proximity matters. Made some great memories this past week. Tigger wrote: Thanks to what I learned on this site and the Playbook, I had 2 really cool encouters. This was the result of the second! He bugled, my buddy responded with pleading cow calls, he chuckled and we let him call us right in until we couldn't close the last few yards we needed! My buddy did a great job convincing him to move the last few yards for my shot. Shot him at 40 yards! Where is Winnie the pooh's bull? Good job curly tail! Your brother looks really happy. I still can't believe we got it done at the 11th hour. 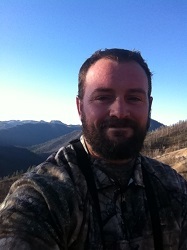 Harsh realities of work and responsibilities setting in this week after an amazing 8 days Elk Hunting. What an amazing addiction. Now maybe I can start thinking about chasing ducks and geese this fall. Loving the photos folks, keep them coming! Congrats to you guys! 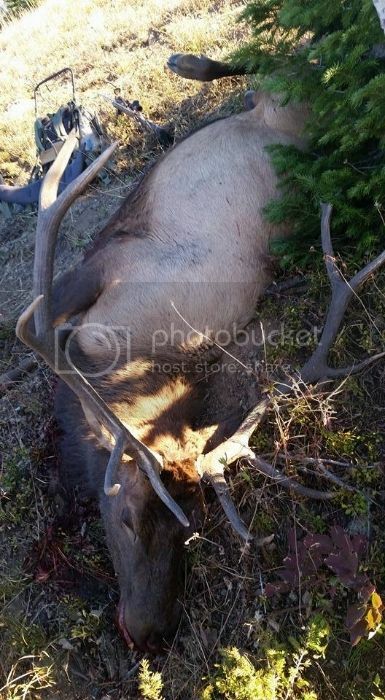 Bull down for the Doc of the ElkNut Crew! My bull took Sep.12. Huge body so my back says. Story will follow. My 18 year old son's first bull, what a great experience this year for him. He went out one night by himself and called in 5 bulls and had the big herd bull at 20 yards twice with no shot due to the brush and 2 days later on the 15th I called this 5x6 into him on a string he cow called and stopped him at 30 yards. We had several other opportunities with 2 other misses between me and my partner mine being the worst at 15 yards still trying to figure that one out. But leave it up to the young buck to get it done. Wyoming 5x5 DIY public land. 45 yard shot with about a 200 yard recovery. Stick wrote: My bull took Sep.12. Huge body so my back says. Story will follow. Man that is a big body. Congrats stick! And congrats to everyone else! Damn stick thats a stud! Congrats to your kid flystrait! Good job Wyo67, do I spy an Elknut Checkler bugle in that pic! Congratulations to The Doc and tigger and everyone else. I've had the craziest deer season so far, but I havent taken anything yet - waiting my turn! Good stuff guys! 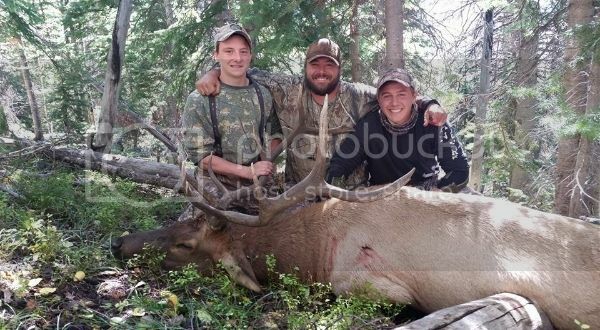 Craig, great first bull for your son! I'll bet he was excited! Here's a bull I took the 19th. Nice bull there Paul (and nice bugle, hehe). Congrats to all that put meat in the freezer. Due to setup mix ups, silent elk and an assortment of other screw ups, didn't get to even draw back and only saw 1 bull this year. It's a process and Paul's playbook and advice can make a difference. 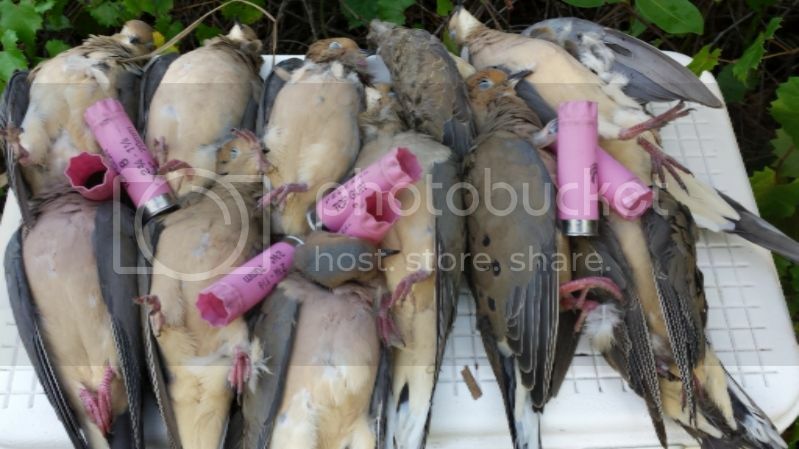 Big congrats to all the successful hunters! Wow, some great harvests for all the Elknut's this year! 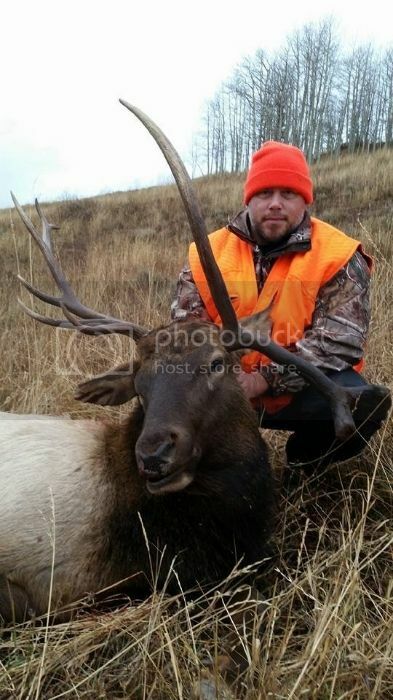 Here's my 2015 Idaho bull; I'll post the story of the hunt later after I get all my gear cleaned up and put away. He'll be some good eating this year; already has been (smile). Rory, way to go sir! I'm sure it's well deserved, can't wait to hear the story! Will, that bull looks like a dinosaur, great job!!! Hope to read about your story too? 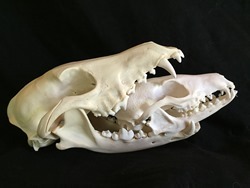 the story is on the deer forum, but this is my first animal of the year! 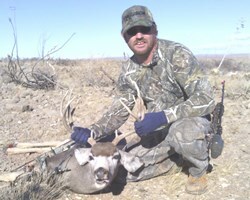 Story of this 3-point buck on the deer forum. Dang Tireguy, thats a beast! Congratulations, will you post a story? I bet you got a good one to go with that trophy! GobbleFarmer wrote: Dang Tireguy, thats a beast! Congratulations, will you post a story? I bet you got a good one to go with that trophy! Thanks sir! I wish I had a great story to go with it! I shot him with a 30-378 Wby Mag loaded with a 210 grain long range accubond and he fell on the spot. He was only 150 yards away, but it was by far the most difficult shot at that distance I have ever taken. Seeing something like that through a scope can be really intense!! I could barely hold the cross hairs on him haha. It didn't help that I am not in shape and was not prepared for the elevation change or the unusually high September temperature. 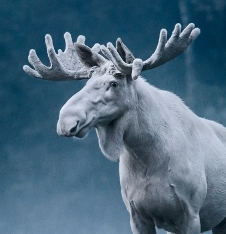 It's amazing how an animal that size can be so elusive. We didn't see much the first few days, I guess because if the high temp, but this guy showed up on day 3 and I was able to get him. I was very surprised I got him, I was shaking nearly uncontrollably haha. It was an amazing experience! Rifle hunting in September? crazy! 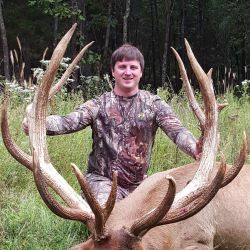 Are you getting him mounted and do you have a score on him? Do they they fit on the meat pole? Man, I can't wait until next week. Shot this bull on 9/16. In the picture with me is my friend Terry. 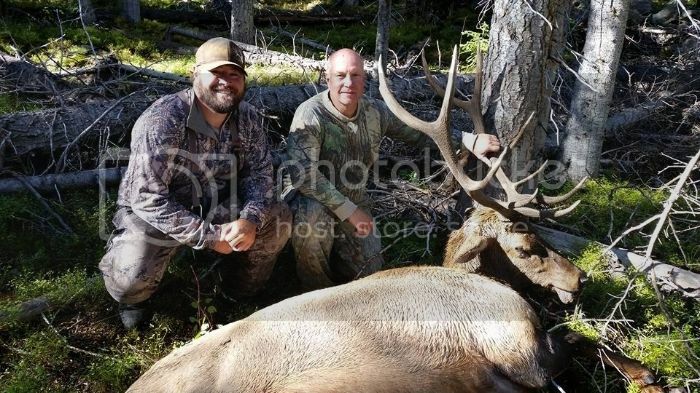 He's never hunted elk so it was my goal to help him get a bull. 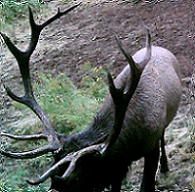 This elk walked right past him but he wasn't able to draw his bull since he was pinned down (he was like 7 yards away). The bull got nervous and turned around, at which point I drew my bow. As he was walking away I stopped him with a cow call 30 yards from me and about 15 yards from Terry. I glanced over at Terry and he still wasn't able to draw his bow, so of course I let an arrow fly. I think this was the first time I have shot at an extreme incline. I thought I had heard the bull go down but wasn't positive. So we waited 30 minutes before looking for blood, but we found the bull almost within 5 minutes (big relief). Turns out I did hit him high, but it did the trick! This was a VERY easy pack out. The bull was small bodied and the pack was only .87 miles. We had it packed out and were back to hunting by 3 pm. It is always fun hunting with a newb; I think he was more excited about me shooting a bull than I was. He also came real close on 1 small 6x6, 1 5x5 similar to the one I shot, and 1 6x6 that probably was in the 360 range (my heart skipped a few beats when I realized how big he was). 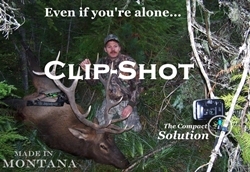 Unfortunately, none of the opportunities panned out and he went home empty handed - but that's elk hunting. Still had a great time together. 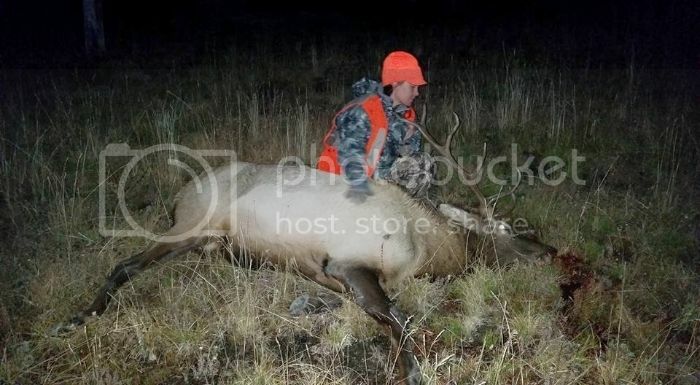 My first elk with a rifle. Hunt lasted less than 15 minutes. It was fun to try something different but its back to bow hunting for me. My daughters first year archery hunting" I knew I could make it dad" Frontal shot at nearly 30." Dandy bull Steve. Share the story if you get a chance. Damn awesome Steve. Thanks for the story and pics. I ran out of battery for my camera by the time I harvested my cow on this hunt, but we had a great hunt. 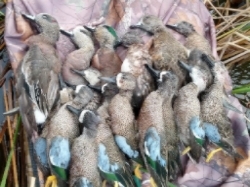 I had a good friend I used to hunt with come and hunt with me (I usually hunt alone), boy I forgot how much more fun it is to hunt with a friend who shares in your passion, hunts the same style, and can keep up physically! Hopefully we can make it a yearly occurrence. I harvested on the second day of the hunt, and had to go back about 2.5 miles to get away from the yahoos (who thought they were long range shooters ). Had a blast. 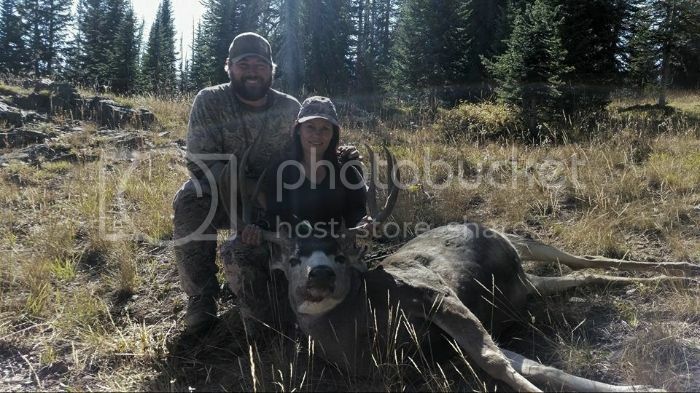 Then it was off to a different mountain range to hunt a few days with my daughter, she had opportunities, but just couldn't connect on a deer. But we made some great memories in the mountains. And lastly I had a few days to chase my own deer and was able to harvest this nice little buck. Great year. Here is some fresh meat for the pole... I just got back from a very very long stint in the woods. I'll post all the animals here but as a group we took 6 elk, 4 deer, and a bear. I also post one extra elk that a buddy of mine from the mountain asked me to help him recover so I am tossing that on here as well. Congratulations to you and your group, James! Thats awesome! And you too, elkstalker! One heck of a season! 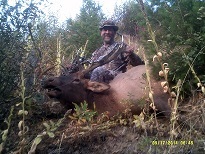 Here's my Idaho archery bull, taken September 17. Thanks to my good friend Twinkieman for doing an expert job calling and for sharing the backpack work with me. Look for story of the hunt as a separate post on the forum. Timer on the camera took us by surprise, so no smiles but, we sure were happy. Dandy bull mister. Congrats to you and your caller! First year hunting elk and harvested this 5x5 on a DIY Idaho public land hunt. Thanks to paul and the dvd's. Got a nice 4 point bull during second rifle season in CO. Public land. Congrats on some fine harvests guys! 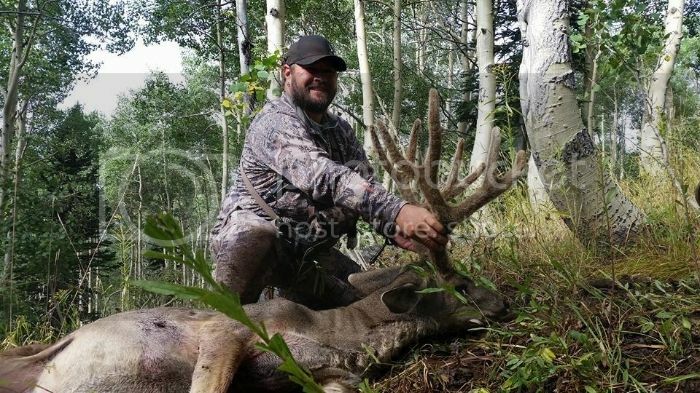 dougthechug -Way to knock down a nice bull the first year out! That's a huge accomplishment in itself. 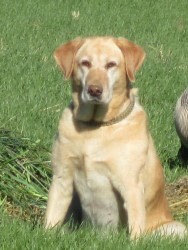 LostDog - Nice backstrap surgery! Makes me hungry and reminds me to take out some meat for this weekend! tireguy - Holy hell, what a season you're having! 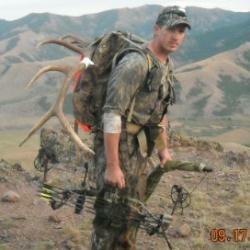 You follow up that dinosaur bull with a toad of a whitetail. Congrats mister. Gobble - Sounds like you're slowly but surely filling your freezer up. Congrats on deer #2!